The new Ford Explorer will be a crucial product for Ford going forward. Some people like loud cars, some people like quiet ones. No matter your preference, you can’t deny the luxury of a quiet interior. For SUV buyers seeking peace and quiet behind the wheel, the 2020 Ford Explorer introduces a dual-wall dashboard to help create the quietest Explorer cabin ever, according to Ford. This is a first-for-Ford innovation applied to the 2020 Ford Explorer. Going further, a dual-wall dashboard is paired with acoustic glass and ‘Active Noise Control’, which is standard on the new Explorer Limited Hybrid. The windshield is designed to combat engine, road, and wind noise in the cabin. Unfortunately, this tech is only available on Limited Hybrid models. The fact that the 2020 Ford Explorer Hybrid offers the most hushed interior of the lineup is an encouraging sign, as anybody who has ever owned or ridden in a hybrid vehicle will quickly realize that the fluctuating engine drone working in tandem with the vehicle’s battery pack can be far from refined, or quiet, despite the perception of silence commonly associated with electric vehicles. Like all of its vehicles, Ford Motor Company developed the new 2020 Ford Explorer in their driving dynamics lab. Ford says that this laboratory allows engineers to test the vehicle sound in different settings, including a semi-anechoic chamber with powered rollers to simulate road noise, and in temperatures ranging from -40 degrees to 140 degrees Fahrenheit. This lets engineers focus on materials that shrink and expand, which may cause squeaks and rattles that disturb a quiet ride. The 2020 Ford Explorer’s quieter cabin offers more space and technology compared to the 2019 Explorer. 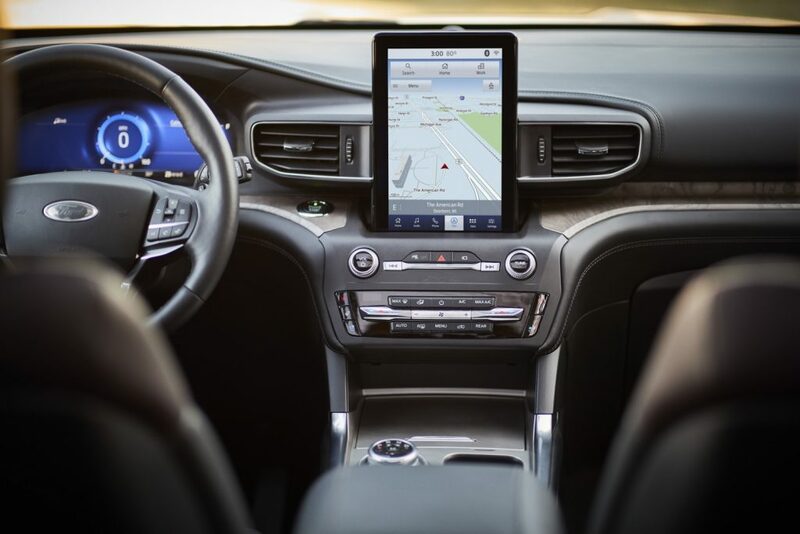 The 2020 Explorer is available with a 10.1-inch portrait-mounted touch screen complete with full-screen maps, traffic-sensing ‘Ford Co-Pilot360’, and other driver-assist innovations to help reduce stress. Reverse brake assist and ‘Active Park Assist 2.0’ are also available in the 2020 Ford Explorer. Subscribe to Ford Authority for more Ford Explorer news. I am interested in this 2020 Explorer Hybrid, but please move that “tablet” console screen down or lay it sidewards (landscape) !! induldge in reckless behavior, we have to pay the price for ‘nanny” technology that we really don’t need. can offer bigger standard engines now.